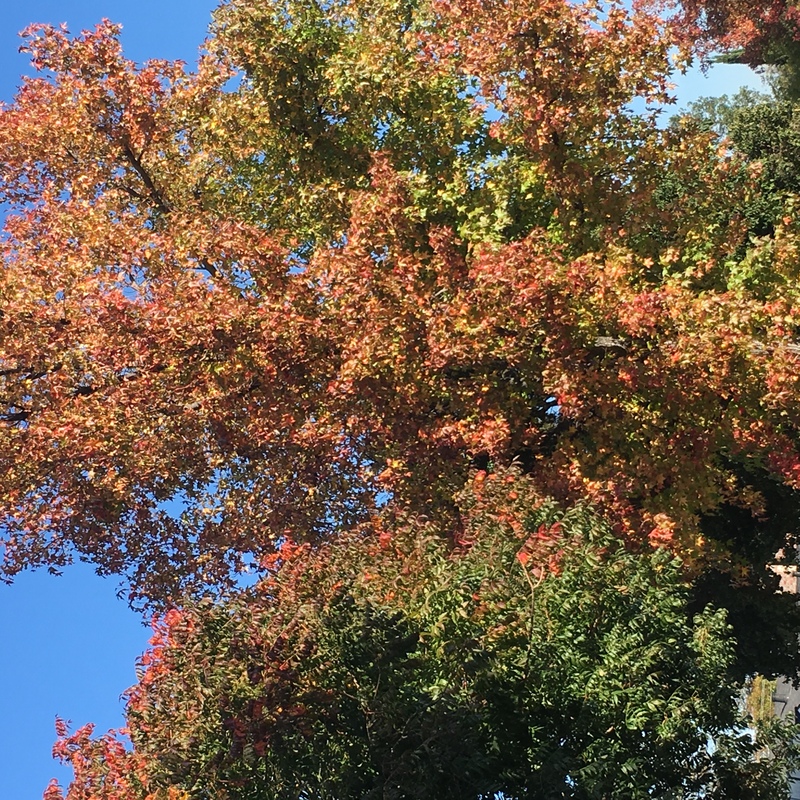 Home » The Blog » Reviews » Legend…of the fall, er, autumn! 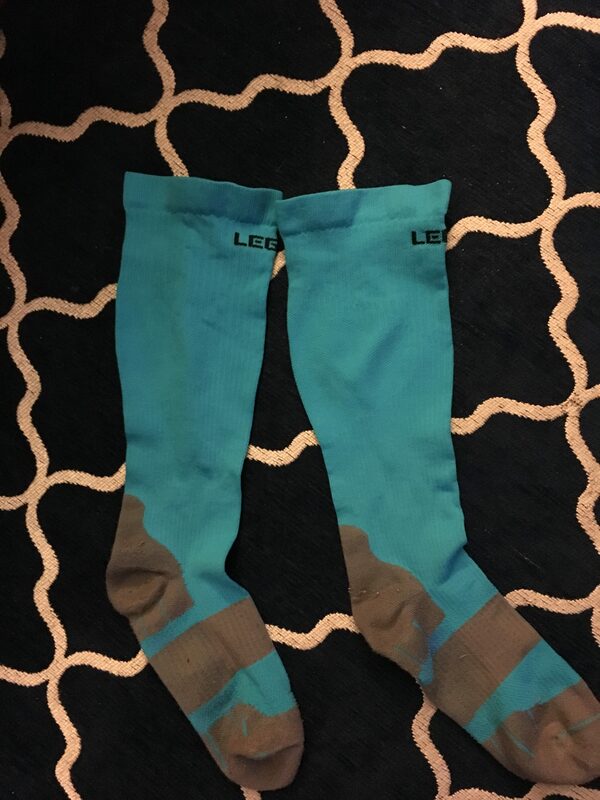 Disclosure: I received a pair of Legend Compression socks for testing purposes because I am a BibRave Pro. Learn more about becoming a BibRave Pro, and check out BibRave.com to review find and write race reviews. It’s a great way to help race directors see what is working and what needs improvement, and to help other runners find out what a race is really like. If you've been following along, you know that socks are my jam. Even before I started running, I had two large dresser drawers filled with socks. (With the addition of compression socks, they have now spilled into a third drawer. Clearly it's time to get rid of some t-shirts so I have more room.) Naturally I leaped at the opportunity to try Legend Compression socks. Fresh out of the package and ready for testing–instructions included! See how those socks are leg-shaped and not tube-shaped? Yeah, that's the mark of a quality sock right there. (Otherwise how could the compression be graduated?) They have the size marked on them, which initially made me worry I had two left socks. Nope! While I'm on the topic of shape, the “Wear 101” card that came with the socks is helpful in case you've never tried compression and I'm surprised other brands don't include it. Basics: to put them on, bunch up the sock and get your foot in there first, toes then heel; then begin to pull them on from the bottom (as opposed to pulling on the top edge of the sock). To take them off, reverse the directions (don't just yank on the toes!). Store flat with their friends. I'm used to struggling with compression socks, like they are a girdle for your calves, but Legend isn't like that. BibRave Pro Chris also loved how easy they were to get on and off. The first try-on! NO seams. Wraps around the arch of the foot without squeezing. Cushion in the toe and heel. Sweat-wicking too! Legend is based in North Carolina. 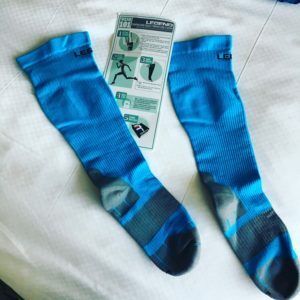 All of their compression performance socks, leg sleeves, and recovery socks are made in the USA. That by itself is a huge plus for me. Even better, the founder, John Thomas, spent 30 years working in the medical industry (where compression products are tightly regulated, unlike the sports products on the market) and ran the largest compression manufacturing facility in the world. They are not just “tight socks” however. Think of how your blood circulates in your body, with arteries taking fresh, oxygenated blood from your heart to your muscles, and veins bringing back the “used up” blood. Veins are closer to the skin and less muscular than arteries, so they are more susceptible to a hug from a nice sock. Since the veins in your legs are helping to move blood back to your heart, they are working against the pull of gravity. When you work out or run, your muscles need more oxygenated blood (hence your pulse speeds up and your heart works harder), which means your muscles produce more de-oxygenated, used-up blood, and those little veins have to work harder. The theory is that giving those veins a little hug helps to give them a leg up (you know I couldn't resist!). Look, I'm on a roll! I crack myself up, but really, compression plus the Nano Roller is the best! From personal experience, I can tell you that compression also helps reduce the amount of movement in your legs. Okay wait, let me explain that… If you are a woman, you're familiar with the difference between a good sports bra (keeps your breasts from bouncing all over the place) and a bad one (lets your breasts swing from side to side and bounce up and down); if you're a man, you may have similar observations from seeing female runners. 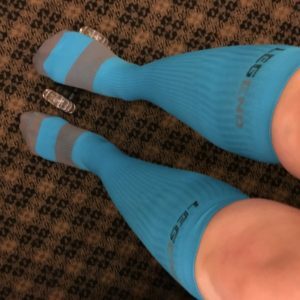 Compression socks basically do the same thing as a good sports bra, hugging your muscles and other tissues a little tighter to the bone, reducing the amount of bounce. I have big ol' soccer player calves (they are strong and muscular, and while they prevent loads of cute boots from fitting, I love them for their strength), so I am a fan of compression. The amount of compression in a sock is measured in millimeters of mercury. Legwear sold as medical grade compression is tightly regulated (no pun intended!) while the “recreational” flavor of compression is not regulated the same way. This is one of the reasons it matter that Legend founder John Thomas has a background in medical compression. (Think about it; if graduated compression helps, what if the compression is reversed or otherwise messed up? #BadNews) Legend Compression Performance Socks are 15-20 mmHG of graduated compression. I have really weird feet, so I prefer to run in double-layered socks and compression sleeves for long runs, but the Legend Compression Performance Socks were delicious for 5k and 10k. BibRave Pro Brie wore hers for trail running, where I'm sure I will also love them. I specifically appreciated the seamless toe construction (seams give me blisters). I also loved them for recovery. (Legend does make a separate compression sock for recovery.) Legend also touts greater power input (makes sense to me, since there is less jiggle! ), increased oxygen levels and blood circulation, and reduced muscle fatigue. I don't have a way to measure these items. Legend Compression Performance Socks were great on my runs, and I loved them for recovery. (Cute, fit well, great for hopping on a plane a few hours after a half marathon.) Right now, you can get a discount on Legend compression wear from BibRave! When you order your first pair, be sure to check out their sizing guide. BibRave Pro John agrees with me that they fit true to size (per the guide on their website). Don't rely on sizing guides from other brands–I have a size 10.5 foot and wear a medium in another brand, but the large Legend socks were perfect for me. Clean, dry, and ready to go! Oh, final note: compression isn't just for running! BibRave Pro Haley likes to wear hers when she lifts. Same benefits–increased circulation, “fresh” legs, comfort–plus they make a nice shin guard for your deadlifts. (I'm looking at you, CrossFitters.) Legend comes in lots of fun colors (BibRave Pro Jessica picked purple!) so grab more than one pair! 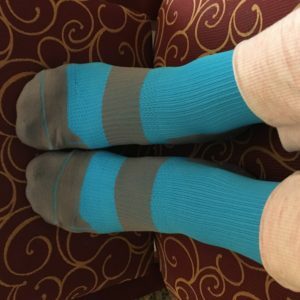 Have you tried compression socks? ← Luvo love for exciting new choices!